This page is a brief guide for visitors to the Isle of Wight: a small island off the coast of South England, near Southampton and Portsmouth. 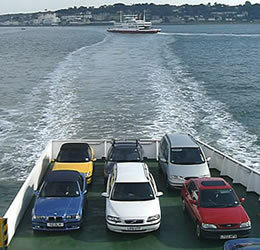 There are ferry services to the Isle of Wight from Portsmouth, Southsea, Southampton and Lymington. 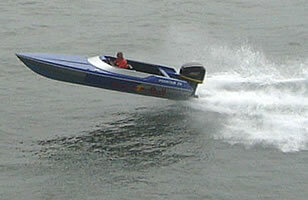 These make the short crossing over the sheltered water known as the Solent. 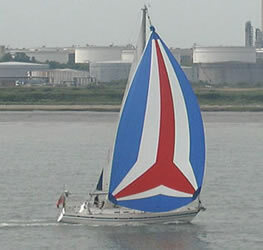 The Solent is one of the most popular places in the UK for sailing. 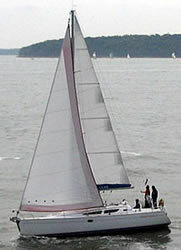 There are famous yacht races each year at Cowes. 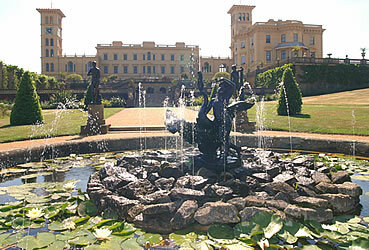 Osborne House is a palace where Queen Victoria spent many of her holidays (featured in the film Mrs Brown). 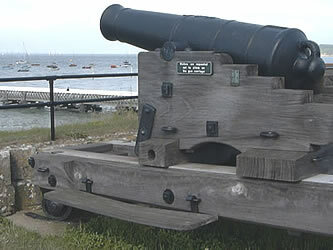 It is located near East Cowes. 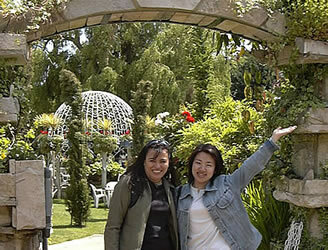 The rooms are beautifully decorated, and there is also an attractive garden. 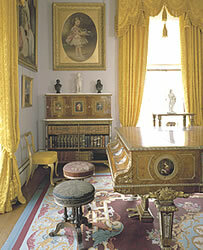 The property is managed by English Heritage. In the winter months the property can only booking a special guided tour in advance: between mid-November and the end of December these one-hour tours (given by costumed guides) show how Queen Victoria celebrated Christmas here. 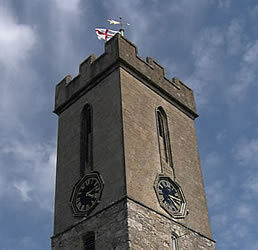 For visitor information, see: http://www.english-heritage.org.uk. 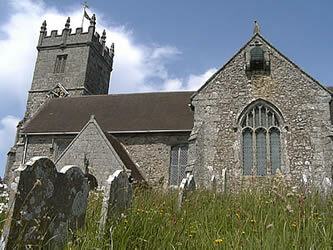 About 30 minutes' drive from Cowes is Godshill. This village gets its name ("God's hill") because it has a church which is built on top of a hill (not necessarily a good idea, because the tower has been damaged by lightning several times). Most of the present building is about 650 years old, and there has been a place of worship here for about 1,000 years. Godshill Church is popularly known as the "Church of the Lily Cross" because it contains an old wall painting showing Jesus being crucified on a three-branched lily (a symbol of purity). 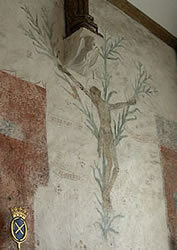 This is the only remaining wall painting of this type in the UK or Ireland, and is believed to date from about 1450. From the entrance to the church you can look down on the attractive straw rooves of the six original thatched cottages in the village. 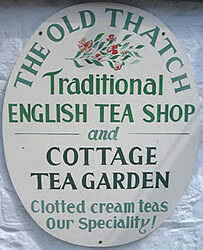 During the rest of your time here you can visit the souvenir shops, or enjoy tea in one of the old buildings or gardens. Alternatively, you can pay a small entrance charge to visit the model village. This contains models of the villages of Old Shanklin and of Godshill itself - so you can find a model of the model village inside! 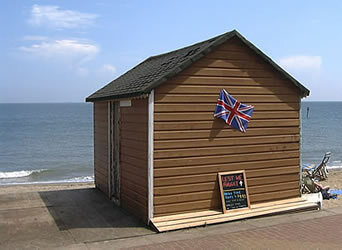 About 15 minutes' drive from Godshill is the seaside town of Shanklin. There is a path through a garden and down some steps which takes you down to the sea. Take a towel with you if you want to paddle in the sea (or a swimming costume if you want, although the water can be quite cool - there are beach huts which you can rent where you can change your clothes). 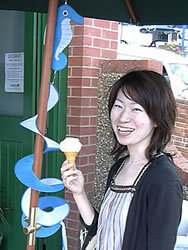 Enjoy walking along the beach, or eating an ice cream from one of the shops along the seafront. Shanklin played an important role in the "D-Day" operation during the Second World War: PLUTO ("Pipe Line Under The Ocean") was a pipeline from here to Normandy, which was used to supply the army with oil after it landed in France. 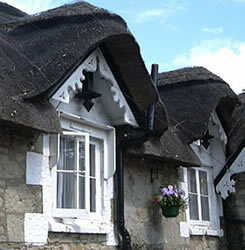 The Old Village contains several attractive thatched houses, and many places to buy souvenirs or to have a meal. 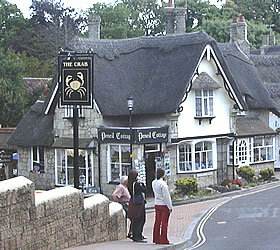 The American poet Henry Wadsworth Longfellow stayed at the Crab Inn in 1868. 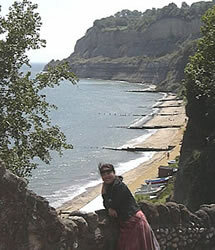 From Shanklin it is about an hour's drive along the south coast to Freshwater Bay. 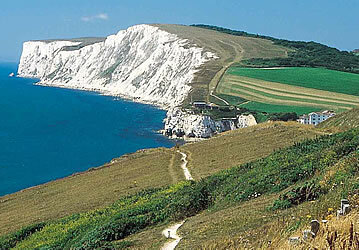 The white cliffs are made of chalk (made from the skeletons of dead sea animals which became compressed under the sea). 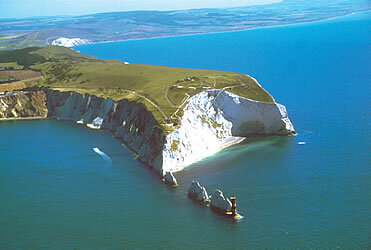 There are white cliffs like this along several parts of the south coast of England. 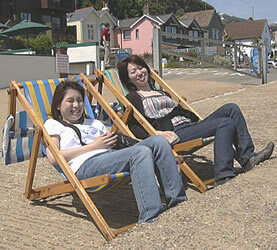 At the most westerly part of the island is Alum Bay. The cliffs here are made of layers of sand of many different colours: shades of red, yellow and white. Sometimes part of a cliff collapses, because of erosion by the sea. From Alum Bay it is possible to take a boat trip to see The Needles: several small chalk islands which used to be part of the mainland. A lighthouse (built in 1859) warns passing ships about rocks which are hidden under the water. 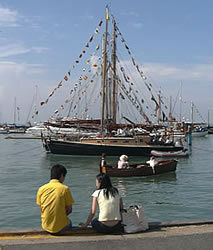 On the north-western coast of the Isle of Wight is the historic town of Yarmouth. It contains a small castle which was built by Henry the Eighth as part of England's defences against invasion from France. 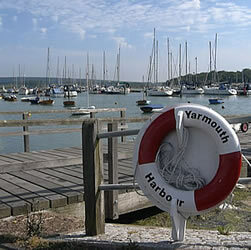 It is a popular centre for yachting, and is also a ferry port (car ferries travel from here to Lymington). 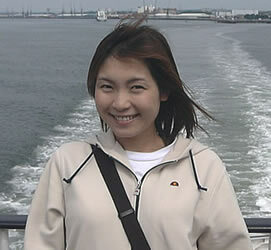 There are open-topped buses which take visitors from Yarmouth down to Alum Bay and the Needles. There are many locally made foods and products which will make good souvenirs for your visit. 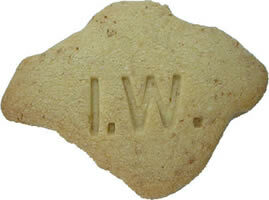 At the Rock Shop in Shanklin Old Village you can buy shortbread cut in the same shape as the Isle of Wight, or brightly coloured sticks of "rock". 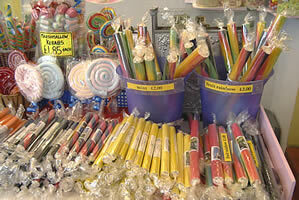 Rock is a traditional type of sweet sold in English seaside towns since Victorian times - the name of the place where it is sold can be read at the ends and continues all the way through the stick. Local agricultural products can be bought at farmers' markets. 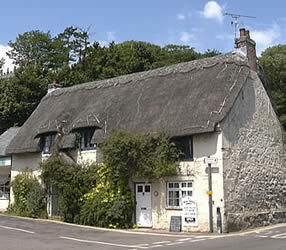 The easiest and cheapest way to visit the Isle of Wight from London for a day-trip is to take a guided coach tour. Most of the photos shown on this page were taken during a tour operated by Anderson Tours. 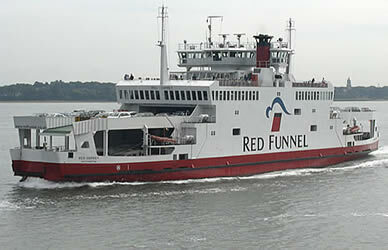 Choose appropriate train or coach journeys to connect with the ferry/hovercraft service you need (see below for more information). You are recommended to take the train to Portsmouth - if in London leave from Waterloo - then catch the Portsmouth-Ryde ferry, and use the train service between Ryde and Shanklin; note that you can buy a train ticket directly to Sandown or Shanklin, including the ferry journey. 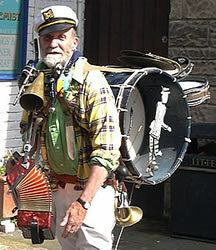 For coach timetables and to buy a ticket online, see: Shop/Company/NationalExpress. On the Isle of Wight there are Island Line trains serving Ryde, Brading, Sandown, Lake and Shanklin: http://www.island-line.co.uk. "Quiet, contemplative and utterly relaxing, the Isle of Wight may only be a couple of miles off the Hampshire coast, but it is a world of its own. Over a third of the island is an Area of Outstanding Natural Beauty and there are 25 miles of clean and unspoilt beaches. Another big plus is the weather, which is more clement here than anywhere else in Britain "